Toshiba reckons its entertainment-focused Satellite P50 is the cream of the crop when it comes to premium laptops, so we went hands on to find out for ourselves. Clad entirely in brushed aluminium except for a black bezel surrounding the screen, the P50 is a Windows 8 laptop that features a 15.6-inch display offered with optional 10-finger touch functionality. We preferred the two-tone silver and black design of the Satellite S50, but the P50 is still an attractive specimen. The laptop possesses a strong hinge that resisted wobble after we prised it back with one hand, and we were unable to detect any flex in its solid metal body. It's a muscly boxer dog of a device that could take a knock or two and emerge unscathed. The P50 houses Intel's fourth generation Haswell i5 or i7 CPU, though a third generation Ivy Bridge is also offered. Equipped with 16GB RAM as standard (but upgradeable to 32GB), it's a veritable powerhouse. Swiping through apps the operating system's Modern UI was seamless, resulting in zero slowdown. Creative types and gamers will be interested in kitting out the P50 with either an NVIDIA GeForce GT 740M (with up to 2GB VRAM) or a GT 745M (with up to 4GB RAM). Those that do should opt for the full HD 1920x1080 pixel resolution screen on offer, rather than the standard HD 1366x768 pixel resolution variation on our demo model, which we feel doesn't do justice to the hefty specs on offer. The P50's backlit keyboard offers adequate spacing between keys and decent travel, and we found ourselves able to type quickly and accurately with minimal effort. The roomy trackpad offered plenty of room to navigate the desktop, and its raised left and right buttons offered some welcome tactile feedback. We also tested the laptop's pair of harman/kardon stereo speakers, which blasted out full and rich sound and would serve as a suitable backup in the absence of a full speaker system in a medium-sized room. 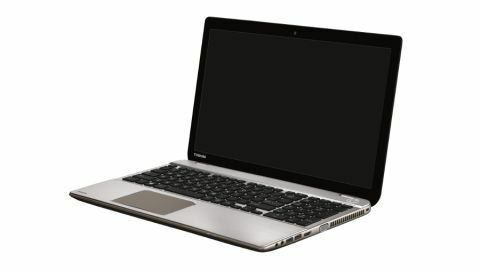 Toshiba's P series of laptops also include Wi-Fi Miracast and Intel's Wireless Display technology, which allows you to wirelessly transfer multimedia content stored on the device to a compatible television. The Satellite P50 is a device that's certainly capable of housing some impressive specs for those that don't mind lugging around a bit of extra weight for the privilege. It's destined to go on sale in Q3 at a starting point of £599.